The picture at right represents some of the contrasts that we observed on our recent trip to Europe. Outside of the room, you can see a building that is anywhere from 100 to 300 years old. 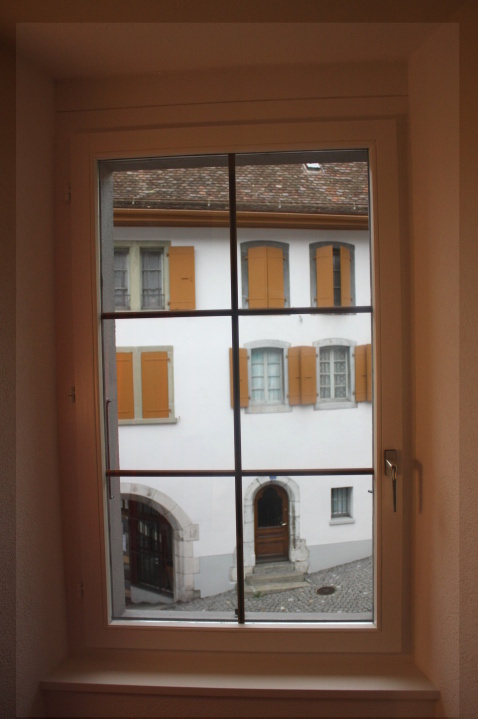 Every window has shutters which have been used for years to keep noise and light out. In contrast our hotel room (and every hotel room we stayed in) was equipped with modern windows that make North American models look primitive. As expected, the windows open along the vertical hinge, but the cool feature is that with the twist of the handle, they can be made to tilt open leaving a secure ventilation gap at the top. When closed, the window seals like an airplane door, which makes for almost zero air leakage. The good seal was further appreciated, considering that the street is about 2 feet from the window.